The most memorable and iconic way to see the Italian countryside is on the back of a Vespa. This classic scooter has been the image of fun loving, relaxed Italian lifestyle since it first appeared in movies way back in the 1950’s. 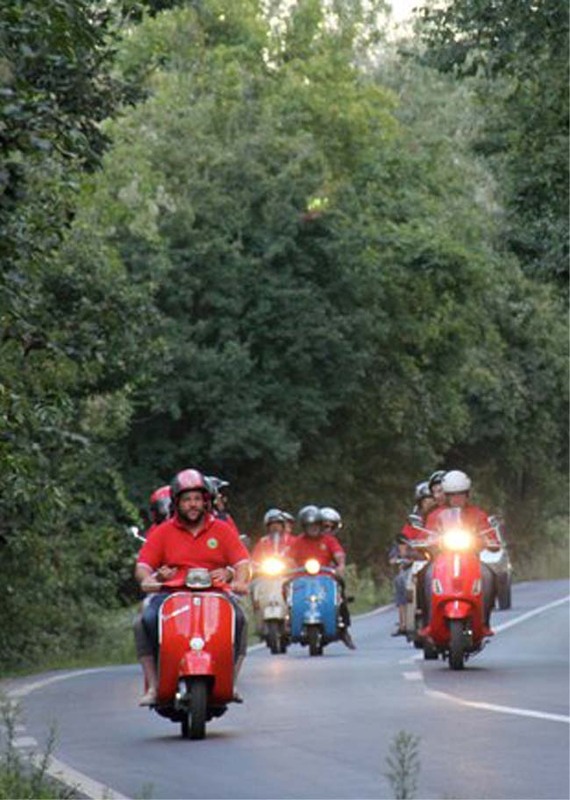 A favourite part of the Umbrian tour is always the Vespa trip. Everyone enjoys the chance to ride on the back of one of these classic machines. 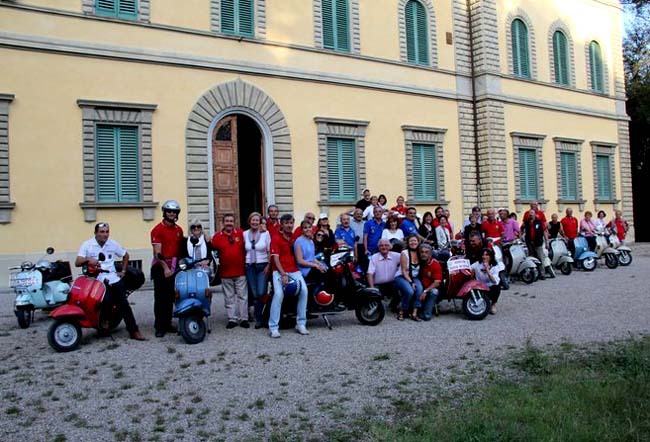 All have been lovingly restored and cared for by the enthusiasts from Citta di Castello Vespa Club who happily provide the transport for the day’s excitement. The Vespa tour constantly provides a highlight of everyone’s holiday. There is a tangible sense of anticipation in the air as soon as the scooters start up and the party sets off. Weaving its way around the city and out into the surrounding green countryside. There is a great sense of fun and freedom as the group negotiates Castello’s narrow streets and then out onto the open road and the green wooded hillsides. Imagine for just a couple of hours you are part of a liberated, motorcycle gang heading down the highway, looking for adventure, or at least a café bar for a drink and a cake. The club love these days just as much as the visitors, they get to show off their gorgeous scooters and the wonderful Umbrian scenery, while having a great day out meeting new friends. This is the beauty of Umbria; the local people love making new friendships with visitors and freely share their enthusiasm for this very special part of Italy. Debbie from Australia; who travelled over last year with “Mia Umbria con Antonella”, summed it up. Once the ride is over it’s back to a local restaurant where the group all enjoy a relaxing meal, wine and chat together. After all, this tourism lark is quite tiring. 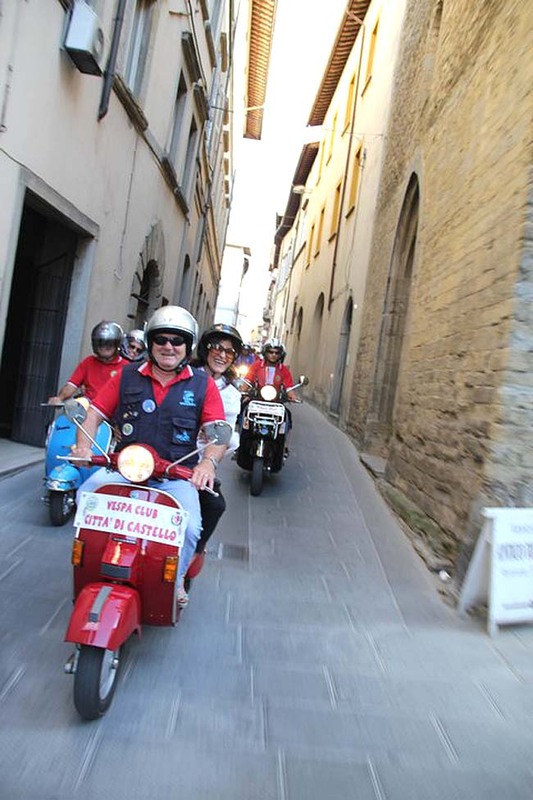 If you would like to find out more about Vespa trips around the Umbrian, Tuscan countryside or the many other memorable days out, please contact Travelling Content for more information. This entry was posted in tours, Travel, vacation and tagged Citta di Castello, day out, day trip, scooter, Tuscany, umbria, Vespa. Bookmark the permalink.